Decorating your house is one of the best parts of the Christmas season. Households everywhere look magical on the run up to Christmas with trees and tinsel and wonderful colours. But while the Christmas tree is the staple in every home’s festive décor, the theme of the decoration varies widely from house to house. While red, green and gold were once the obvious choice for Christmas decorations, nowadays there are dozens of themes to choose from. In recent years blues and silvers have become popular with midnight blue imitation Christmas trees selling by the shelf load. 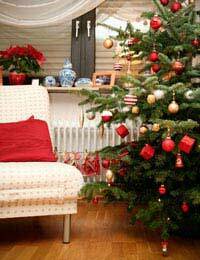 White Christmas trees are also popular, while the more adventurous can even opt for red or purple. Or, if you really can't decide, go for a fibre-optic tree that changes colour all on its own. But colour schemes are just the beginning! You can turn your home into anything you like with a little imagination. Here are just a few ideas that might take your fancy but remember there’s a whole world of possibilities waiting for you! For anyone with a sweet tooth this is the perfect theme for you. Adorn your Christmas tree with candy canes and sweets wrapped in brightly colours wrappers. Use a needle and thread jelly babies together and hang across the branches. Instead of an Angel at the top of the tree try a gingerbread man, secured with an elastic band. Your tree will look good enough to eat. Everyone knows how beautiful snow is. When you wake up, look out of your window and find everywhere covered in a sheet of soft, white snow it really is a breathtaking sight. So take some tips from Mother Nature and transform your house into a winter wonderland. Use a white Christmas tree with twinkling lights and frosted decorations with silver trimmings. Get hold of some white fake fur fabric and fleece and spread it across furnishings and window sills, hang snowflakes from ceilings and across windows and put fake snow powder on house plants. It’s the place where children’s dreams come true, so imagine the delight on your children’s faces when you turn your house into Santa’s grotto. Red and green are the must have colour scheme for this along with candy canes and lots of elves, or Santa’s little helpers as they prefer to be known! How beautiful do houses look in the old Christmas movies? Long before fibre-optics and electrical lights, Christmas decorations were stylishly simple with fabulous wreaths and flowers and candles adding a subtle glow to the room. If you want to move away from garish decorations why not choose an old-fashioned Christmas theme and give your home a touch of understated class? Place wooden toys and old fashioned dolls about the house in wicker baskets - and decorate with red ribbons, holly and ivy. Old fashioned children's furniture and toys make fantastic points of interest to decorate at Christmas. Look out for old fashioned children's prams, rocking chairs, wicker chairs, toy boxes etc - clean them up and fill with parcels, adorn with pine cones, ribbons and holly - or drape a floppy teddy, or victorian style doll across each. Hang garlands of fir about the stairs, over mantlepieces and doorways - adorn with red ribbons and pine cones. You may only decorate the downstairs of your home but this year why not take things a step further and decorate your children’s bedrooms too. You can let them choose a theme of their choice and they can help decorate. Buy small trees and let the kids decorate them however they please – making this Christmas season even more magical.